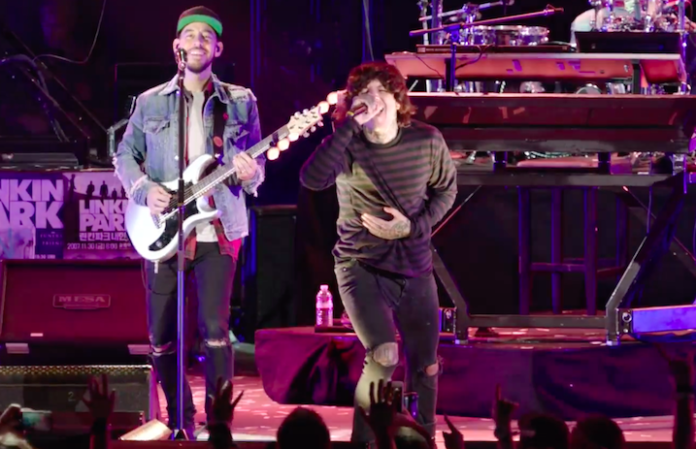 Oli Sykes of Bring Me The Horizon performed a moving tribute to Linkin Park's Chester Bennington yesterday during a special tribute show at The Hollywood Bowl. During his performance, fans noticed there was something a little strange about his performance of the classic Linkin Park track “Crawling,” one of the most recognizable Chester tunes. Something was a little off about the audio during the official livestream, and it sounded as if Oli was actually lip-syncing to the track rather than singing. Oli himself took to Twitter to clear things up, noting that Chester was his “idol” and explaining that, due to technical difficulties, audio of his rehearsal from the night before was used during the steam. You can hear it on the official stream archive below. Fans captured the actual performance from the show via live video, which you can listen to below. As you can see, there was no lip-syncing involved, and Oli did a great job performing one of Linkin Park's best-known songs. Sykes stressed that he “takes this stuff to heart,” when addressing fans tweeting at him about the issue, showing appreciation for the entire experience and thanking Linkin Park for inviting him to be a part of it. If you missed the show, you can check out the highlights here. Did you attend the concert? Let us know in the comments below!